March 2012 was the warmest March on record across much of the USA (13 degrees above normal for most of NY). Surprisingly, a couple of growers in NY planted limited corn acreage during the week of March 19th when daytime temperatures averaged about 75 degrees. 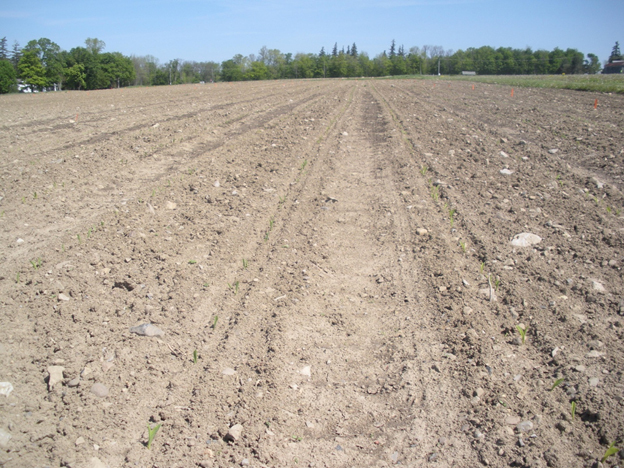 Farmer testimony indicated satisfactory emergence for the March-planted corn. Many other growers, however, elected to wait until the next warm spell, which occurred during the week of April 15th when daytime temperatures averaged about 70 degrees. Farmer testimonies, however, were somewhat mixed for the corn planted during this week with some replanting reported, especially in poorly drained areas of a field. We planted two studies that week: our corn silage hybrid trial with 82 entries on April 20th at the Aurora Research Farm in Cayuga County and a 10-acre seeding rate study on April 18th just northwest of Auburn in Cayuga County. Table 1. 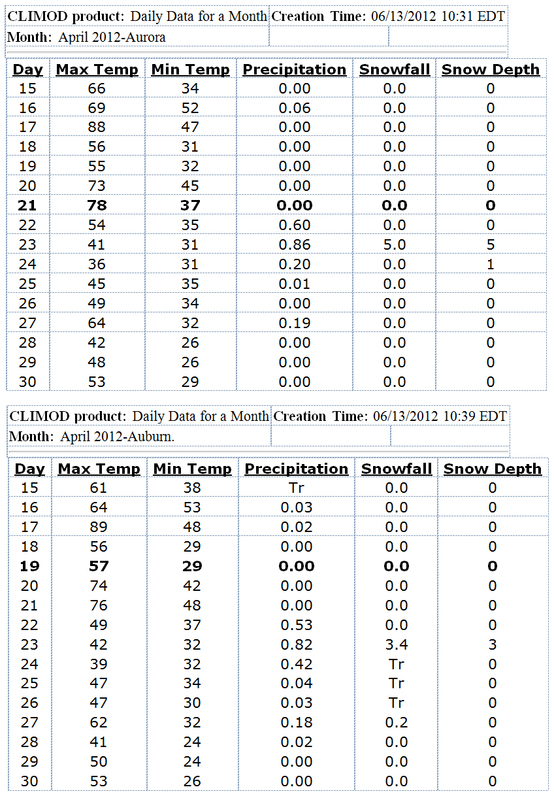 Weather conditions at the Aurora Research Farm and the Auburn airport from April 15-April 30th in 2012. Emboldened date indicates the weather conditions on the day of planting for studies discussed in this article. Weather conditions (daily weather is recorded the morning after at 8:00 AM so the April 20th data at Aurora is recorded as April 21st data when the high temperature was 78) for the first 10 days after planting at Aurora changed drastically (Table 1). At Aurora, the high temperature the day after planting was 54 and then only 2 days above 50 degrees were recorded over the next 8 days (64 on April 26th, reported as April 27th data, and 53 on April 29th, reported as April 30th data). More importantly, only 24 hours after planting, Aurora received a cold 0.6 inches of rain followed by 0.86 inches of precipitation in the form of a 5-inch snow storm 48 hours after planting. Another 0.20 inches of precipitation occurred the following day, 72 days after planting, when the high temperature was only 36 degrees. Also, note that low temperatures dipped down to 26 degrees for two nights about a week after planting. Obviously, weather conditions were conducive for imibitional chilling damage during the initiation of the emergence process, cold stress during the emergence process, and drowning out of corn seeds shortly after planting in poorly-drained areas of a field. When averaged across the 82 hybrids entered in the study, the stand establishment rate (number of established plants in 2 rows of the 20 foot plot length at the V4 stage/86 seeds in each seed packet planted) averaged 85.4% (Table 2). 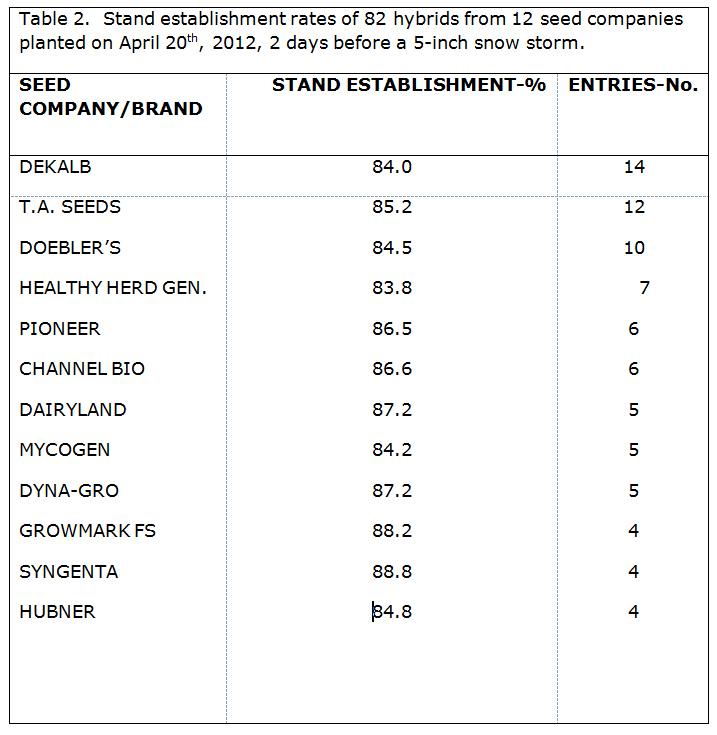 Stand establishment averaged from about 84 to about 89% for the 12 seed companies that entered hybrids. Of the 82 hybrids entered in the study, only six hybrids had stand establishment rates of less than 80% on this drained Lima silt loam soil. Obviously, most modern hybrids can withstand the rigors of cold and wet weather conditions, even 5 inches of snow, shortly after planting (Fig.1 and 2). Table 2. Stand establishment rates of 82 hybrids from 12 seed companies planted on April 20th, 2012, 2 days before a 5-inch snow storm. At the field-scale study where soil conditions are more variable, we counted the number of established corn plants at the V5 stage along the entire length of one row (~800 feet) at each seeding rate for the two hybrids (9807HR from Pioneer and DKC49-94 from DEKALB) evaluated in this study. When averaged across hybrids and seeding rates, stand establishment rate averaged 84.6%. Stand establishment varied from about 83 to 87% between hybrids and from about 84 to 87% across seeding rates (Table 3). This site did experience two warm days (highs of 74 and 76, Table 1) 2 days after planting so conditions were not quite as harsh. On the other hand, low temperatures dipped down to 24 degrees for two nights and 26 degrees another night about 10 days after planting. In addition, this site received about 4 inches of snow a few days after planting. So the 84% stand establishment rate on this production field was quite satisfactory given the conditions. I will add that in a 50 by 100 foot low spot in the third replication of the study no corn emerged (not accounted for in the data because it was a seeding rate study ) so certainly the excessively wet conditions after planting had a major impact on stand establishment rates. Table 3. 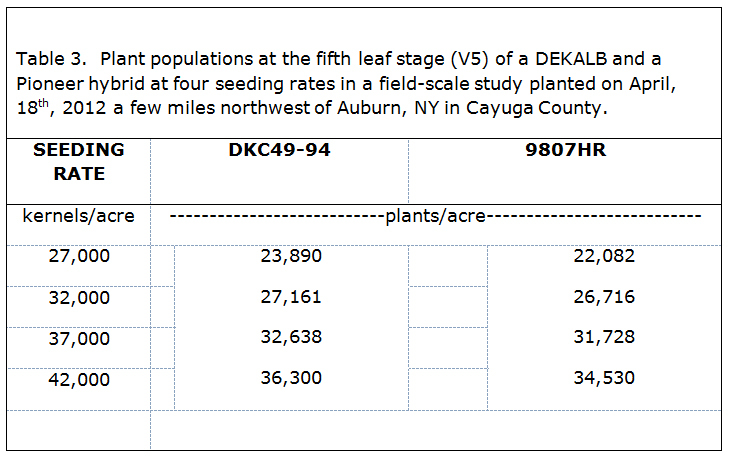 Plant populations at the fifth leaf stage (V5) of a DEKALB and a Pioneer hybrid at four seeding rates in a field-scale study planted on April, 18th, 2012 a few miles northwest of Auburn, NY in Cayuga County. So, what does the stand establishment data from 2012 tell us? First, most if not all modern hybrids have excellent cold tolerance and perhaps tolerance to imbitional chilling (an elusive phenomenon that I am not sure that I have ever observed). On the other hand, modern hybrids have limited tolerance to flooded soil conditions shortly after planting as observed in the field-scale study. So obviously, soil drainage conditions should be a major factor when considering early planting dates (an early planting date lengthens the time that corn is in the vulnerable period to flooded soil conditions, from planting to about the V5 stage). Another factor to consider is planting depth. We only plant at about a 1.5 inch depth in April, especially when cool and wet conditions are forecasted for the immediate future. Many growers mentioned that their planting depth was at the 2-inch soil depth when planting the week of April 15th, which may have contributed to poor stand establishment reported by some farmers in some poorly drained areas of a field or on heavy soils. Fig.1. Aurora corn silage hybrid trial on May 11th, 2012, planted on April 20th. What happens if soil conditions are dry in mid-April next year and soil conditions are once again ideal for planting? I will again recommend to begin planting anytime after April 10-15, provided your location does not experience late spring killing frosts (< 28 degrees after May 15th or so) and your soils are well-drained and do not readily flood. In other words, I recommend to plant fields with good drainage that are not in frost pockets anytime after April 10-15that a soil depth of about 1.5-1.75 inches. I wouldn’t plant much deeper in April unless you are looking for moisture. Fig.2. 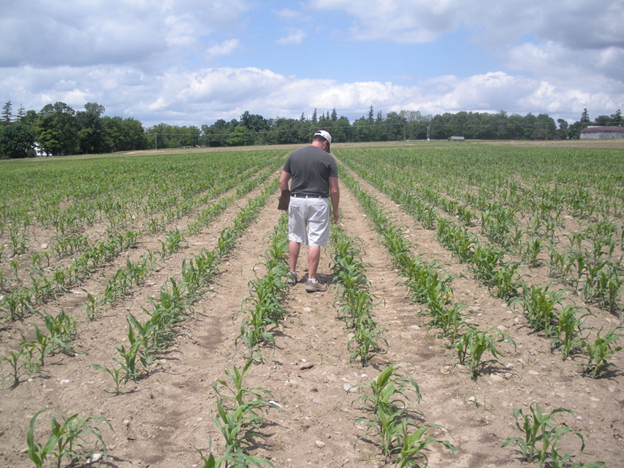 Counting emerged corn plants at the V4 stage in the Aurora corn silage hybrid trial on May 31, 2012.